Can dads get postnatal depression too? It is well documented that women can suffer from postnatal depression (sometimes up to six months after giving birth). But did you know that men can experience symptoms too? According to research, one in ten fathers have experienced postnatal depression and, and 38% are concerned about their mental health. Research also shows that depressed fathers are less likely to display positive behaviours such as warmth, sensitivity and responsiveness towards their children, and instead tend to exhibit negative behaviours including hostility and disengagement. What are the causes of postnatal depression in fathers? There is no single answer as to why some new dads are affected by postnatal depression and others are not. But depression can be triggered by emotional and stressful situations. Having a baby can be an unsettling and challenging experience, and the increased pressures of fatherhood (including more financial responsibility, and changes in relationships and lifestyles) combined with a lack of sleep and an increased workload at home may affect a new dad’s mental wellbeing. Men may not experience the physical changes of pregnancy firsthand, but emotionally and physically supporting a pregnant wife, and dealing with a change in dynamic can put a strain on a couple’s relationship – and impact their emotional wellbeing. Some fathers may even begin to feel second best’ in the eyes of their partners. There is a clear link between a dad experiencing postnatal depression, and their partner suffering from it (or a person or family history of depression). Younger and lower income fathers are also more vulnerable to depression. 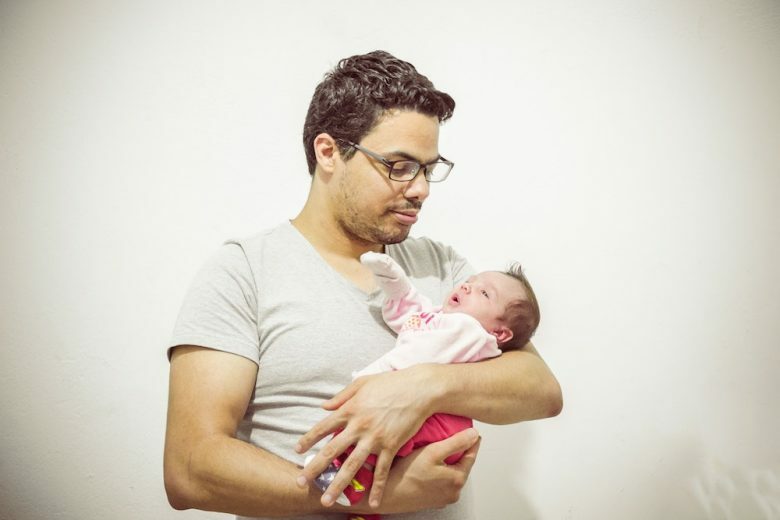 What are the symptoms of postnatal depression in dads? Feeling very low or despondent, that life is a long grey tunnel and there is no hope. Feeling a sense of inadequacy or inability to cope. Wanting to cry or crying a lot. A loss of appetite which may lead to constant hunger but still being unable to eat. Trouble sleeping, either by not getting to sleep or having restless nights which may include vivid nightmares. Hostility or indifference to their partner or baby. Panic attacks which can cause a rapid heartbeat, sweaty palms and a feeling of sickness or faintness. An overpowering anxiety, often about things that would not normally bother you. Physical symptoms such as headaches. Obsessive fears about the baby’s health. Thoughts around self-harm and death. Postnatal depression is usually diagnosed if the illness occurs after birth with no other explanation. According to the DSM-IV and ICD-10 psychological diagnostic systems, the timeframe for diagnosis could vary from four to six weeks after birth. Depression, anxiety and other problems with mood can occur anytime during the first year of your child’s life. Symptoms tend to be persistent and cover a proportion of your day to day life, potentially taking over your ability to properly function. Symptoms can last for a long period of time if they are left and untreated, unrecognised or misinterpreted as just a ‘low mood’. What should you do if you are worried about someone? Men can sometimes feel uncomfortable opening up about their feelings, but it is important that you seek the support you need. So share your feelings with the people you trust; this could be your family or friends, a health professional or a counsellor. While many new parents experience mood changes or feel down from time to time, you may wish to seek help if these moods persist. If you have concerns, contact and seek help from your GP who can provide support services. You also should try and take some time for yourself by maintaining involvement in hobbies, exercise and social activities, even an hour here and there can make a big difference! It may help to meet other dads. Dad groups are becoming more popular, so it may be worth finding out if there is a group in your area. You should also avoid negative coping strategies such as drinking too much, working long hours and staying away from home. As hard as it might feel try and share your thoughts and feelings, it is probably the best thing to do. Treatment options include counselling and therapy, medication and cognitive behavioural therapy. Another option to relieve the symptoms of paternal postnatal depression is Transcranial Magnetic Stimulation (TMS). TMS is a NICE approved treatment for depression that modulates brain activity, leading to a reduction in symptoms. We hope that the most important message here is not to let symptoms of postnatal depression go unchecked. If you or your partner experience any of the symptoms listed in this article, or just don’t feel yourself after having a baby, talk to someone. Sometimes just expressing how we are feeling can help to get the support and practical help we need. And if you suspect that you or your partner are suffering from postnatal depression, please do speak to your GP and get professional help.